The village of Spetisbury lies between the River Stour and the now disused Blandford to Poole railway. There is evidence that Spetisbury was inhabited in the Bronze Age (burial rings discovered in a garden at West End) and Iron Age (early Iron Age hill fort at Spetisbury Rings) but the first documentary evidence is William the Conqueror's Domesday Book which mentioned the manors of Spetisbury and Great Crawford. During the Middle Ages the village consisted of three manors or estates, Spetisbury (in the north), Middle Street (around the village hall) and Great Crawford (to the south). These were gradually combined and by 1800 the landowner Francis Fane owned the majority of the parish. By 1869 the major landowner was the Drax Estate. It is to them that we owe the inconsistent house numbering as only the houses they owned were numbered. Today there are still many signs in Spetisbury of previous centuries. The first record of Crawford Bridge was in 1334, the Church of St john the Baptist has parts dating from Norman times, a carving from the eighteenth century Spetisbury Manor House is set in the churchyard wall, the village hall and houses in St Monica's were once part of a nunnery, many of the cob and thatch cottages date from the eighteenth century or earlier, and many of the medieval fords still exist. The main employment has always been farming, with associated crafts such as blacksmith, bakery, butcher, dairyman. The river Stour and the many springs up West End were probably the reason the first residents chose this area and have continued to provide work and food (the cress beds, reed cutting and basket making, fishing) and leisure facilities (swimming, canoeing). 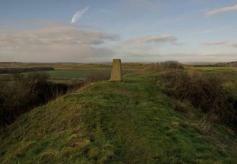 Spetisbury is dominated at its southern extremity by Spetisbury Rings, previously known as Crawford Castle or Castle Rings. This well preserved early Iron Age hill fort, formed by a single embankment and ditch, probably accounts for the later village being here. During the building of the railway in the late 1850s, two massed graves were found close to the rings containing 50 and 40 skeletons respectively. At least two of the occupants had met a violent end as both their skulls were perforated and one had a spearhead still embedded. 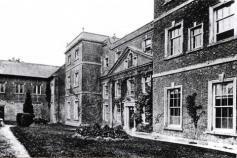 Spetisbury Hall and Sloper School was founded in 1733 by Rev Charles Sloper, rector, and Bishop Hall of Bristol. It began in a barn, and then moved to two sites in West End before the current building was opened in 1862. 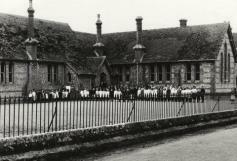 When the school was formed it was for the teaching of reading writing and arithmetic to children of seven years and over. Since then there have been many changes both in the range of topics taught and ages of children attending, and today it is a thriving Primary School teaching children aged four to eleven. For more information on the school visit their website. There was a time, wherever you lived in Spetisbury, you did not have to go far for a drink. 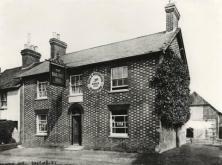 At one stage the village had at least five pubs: the Castle Inn (located in the White House and closed in 1914 - probably sold home brewed beer from the front room), the Black Dog or Dog Inn (by Crawford bridge, burnt down in 1899), the Bugle Horn (near Hathaways, and burnt down in 1887) the Railway Inn (pictured, closed 1985, and said to date from the building of the railway in 1857), and currently the only pub remaining in the village, The Woodpecker - formally the Drax Arms. 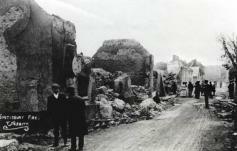 At the turn of the twentieth century, the centre of the village consisted of rows of thatched cottages till a fire at the bakery demolished them all in 1905. The cause of the fire is not known (careless apprentice baker?) but it spread so rapidly before fire engines from Blandford and Wimborne could get to work that cottages next to it and across the road were soon in a blaze, destroying the blacksmith's house and damaging the smithy and other buildings. In 1800 the Manor House for Middle Street became a nunnery for the Sisters of the Augustinian Order of St Monica, and was greatly enlarged. Over time, it housed a succession of three different orders of nuns and one of monks before the final nuns left in 1926. The current Village Garden is their burial ground. Sue Stead has done extensive research into St Monica's Priory, which can be viewed on the website. Spetisbury had a station from 1860 to 1956. 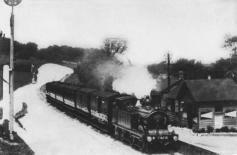 The last passenger train to use the line was on 6 March 1966. The line remained open for goods traffic until 1969 when it was finally closed. The rails and sleepers were taken up, some bridges were demolished and the line through Spetisbury became first an unofficial path, and finally a public footpath soon to be part of the National Cycleway Network. The history of Spetisbury is comprehensibly documented in Ann Taylor's book, "The Book of Spetisbury - History of a Stour Valley Village". Ann kindly provided the above brief introduction to the village's history to whet your appetite. The book is available at local libraries and bookshops.